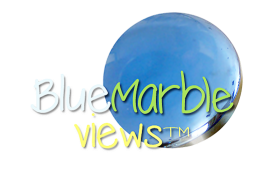 Blue Marble Views - Saving our Blue Marble one ﻿News Story﻿ at a time! Blue Marble Views creates Kid-driven EcoNews blogs and podcasts promoting green eLearning and youth social entrepreneurship. Climate Action and Blue Sustainability EcoNews By Kids for Kids. Blue Marble one ﻿News Story﻿ at a time! Blue Marble Views creates EcoNews blogs and podcasts promoting both Green Learning and eLearning. We invite Green Schools, Academic Institutions, Young Social Entrepreneurs, Parents, Environmental, Wildlife and Sustainable Living Movements to Join our Newsroom. Blue Marble Views will design customized Green eLearning publishing plans for all age groups, combining multiple academic disciplines with the language arts and computer literacy. Offering a truly blended learning experience, it will introduce communications, marketing, journalism, social media, page layout design and public speaking via a virtual newsroom platform to help provide our children of tomorrow the best skill-set required to make them successful, which in turn improves our communities and Blue Marble.